Our Old Testament is the same 39 books accepted by Jews in Jesus’ day and by the early church. There was no meeting or council in the Old Testament times that met to accept these books. It appears that each book was accepted as its writer presented it. The books then were self-authentidcating. The Masoretic Text comes from Jewish scribes from 500 AD. The scribes systematically sorted and co9mpared the various manuscripts. They wrote the variant readings in the margins. There are about 1,200 variant readings, or one per page. We have about 1,000 Masoretic manuscripts. The oldest is fro 916 AD. The variation in these texts is basically non existent. Text (click here and scroll to bottom of the page that opens to see sections including "The Book of Giants", "The Generations of Adam", "The Martrydom of Isaiah", and more. These are documents from Qumran where a group of pious Jews fled to preserve the way of righteousness and to avoid Antiochus Ephipanes around 165 BC. There are two sections of these documents: one calls the people to obey God’s covenant and introduces the “Teacher of Righteousness”; The second records the statutes concerning vows, assemblies, and other instructions for members and for new members. No other ancient writings have been so accurately handed down with such an abundance of textual evidence. 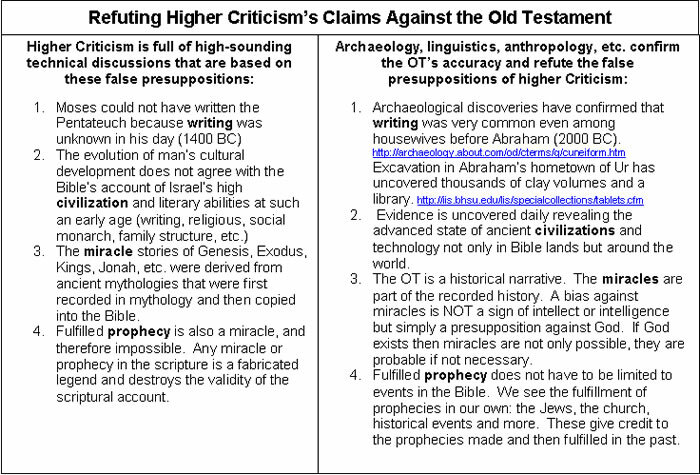 Higher criticism says there were four different writers of the book of Genesis. They call them J, E, P and D . The writers are believed by the critics to have written at different times during the years of 900-600 BC. 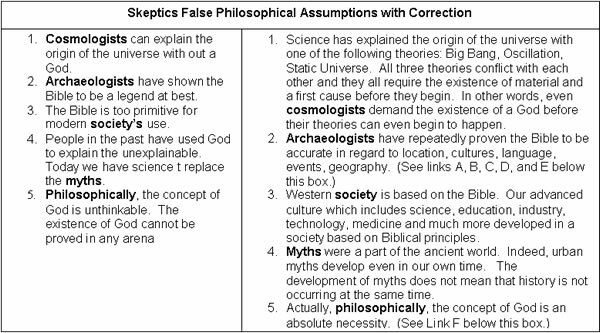 This false theory was developed between 19806-1878. Deuteronomist (D) since in his writing he seems to be aware of the laws and traditions of Deuteronomy. All these peoples, nations and their cities existed and have been excavated. The names of over 40 different kins of various countries mentioned in the OT have been found in documents and inscriptions. The OT has been copied and preserved methodically until our time. There was a man named Moses who led them out of slavery in Egypt some 600-900 years before. Would the kings, leaders, rulers, aristocracy and other religious leaders have accepted the priests’ new find? Would the majority of the people have welcomed an unheard of history recorded by an unheard of man that told them to give 10% to the newly introduced priests and circumcise all the adult males? Followed Moses to the mountain where they saw God descend on the mountain and give the law. Lived in the wilderness and saw the promised land. It is easier to believe these were historical events that made a real impact on a generation of people than to think it was a forgery that blindly convinced an entire generation to foolishly follow undocumented writings.